The ability to adsorb purpose-designed molecules on surfaces where they perform functions such as switching, sensing or catalysis is a key capability in the quest for a future molecular nanotechnology. Molecular switches, that is, molecules with properties that can be bistably and reversibly switched by external stimuli may act as well-defined building blocks that offer the vision of an ultimate integration of functional properties. Retaining the molecular function when adsorbed on surfaces is a challenging task and involves knowledge of electronic and sterical effects. Azobenzene and its derivatives are interesting toy-models to study such effects, because of their well-understood photo-induced isomerization behaviour. Explicit atomistic simulation of the dynamics of molecular reactions can help to gain valuable understanding of processes relevant to catalysis, surface chemistry, and surface scattering. Molecular dynamics on metal surfaces are especially interesting due to a variety of quantum and nonadiabatic effects that determine the qualitative and quantitative outcome of reactions. Such effects include non-adiabatic energy transfer between adsorbate motion and substrate electron-hole pair excitations leading to vibrational cooling of adsorbate motion or quantum nuclear effects that facilitate barrier crossings via tunnelling. Our current efforts are in developing methodology to include the above quantum effects in the study of non-equilibrium processes on surfaces. Fundamental to the design of functionalized surfaces, and optically or electronically active hybrid interfaces is the understanding of the underlying interactions between substrate and adsorbate. 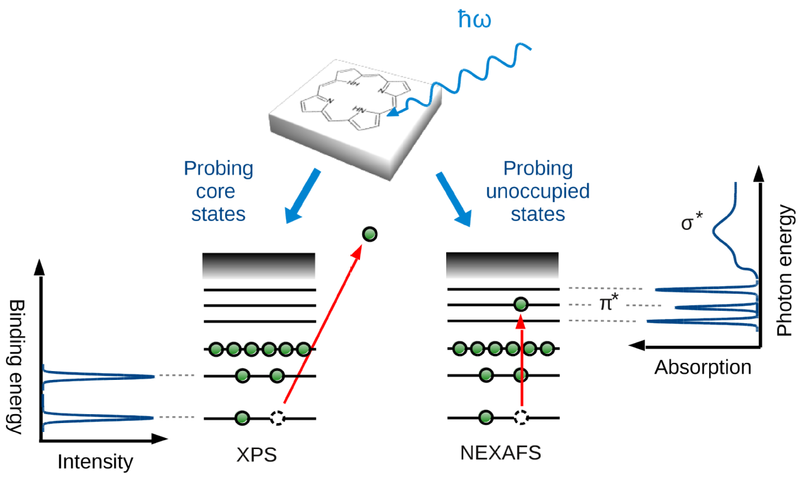 Surface-sensitive spectroscopic methods such as x-ray photoelectron spectroscopy (XPS), near-edge x-ray absorption fine-structure spectroscopy (NEXAFS), and, most prominently, Scanning Tunneling Microscopy and Spectroscopy (STM/STS), play a key role in the characterization of adsorbate structure. These methods have become the workhorses for the study of purpose-driven design based on molecular self-assembly and surface functionalization on the nanoscale. Corresponding techniques to simulate the above act as complementary validation methods and support assignment of spectroscopic signatures to structural moieties. We furthermore work on establishing efficient Density-Functional Theory-based methods to calculate electronically excited states of metal-surface adsorbed molecules. We also actively contribute to the development and assessment of methods that improve the description of long-range dispersive interactions and study the effects of anharmonic mode coupling and finite-temperature on adsorbate structure, energetics, and spectroscopy. The typical system sizes involved in the study of structure and dynamics of adsorbates on surfaces pose a challenge to highly accurate first-principles methodology. Correspondingly, there is a significant need for efficient simulation methodology that addresses large time and length scales than currently accessible to Density Functional Theory (DFT) and efficient ab initio molecular dynamics methods. 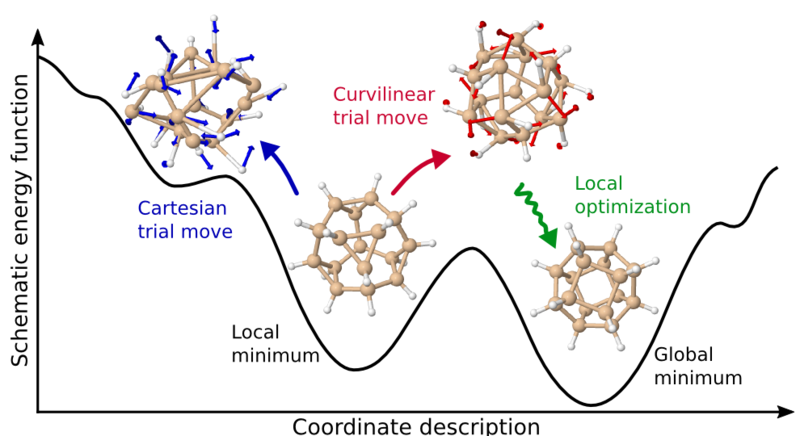 We currently address these challenges by developing global structure prediction methods for complex interfaces and efficient semi-empirical electronic structure methods. Many systems that are currently studied in the context of molecular machinery and nanotechnology are far too large to be studied with DFT and more approximate methods have to be developed. In electrodeposition the key challenge is to obtain better control over nanostructure morphology. A high level of control will lead to better nanocatalysts and thin-films for optoelectronics. Currently, a lack of understanding exists concerning the initial stages of nucleation and growth, which ultimately impact the physicochemical properties of the resulting entities. First-principles simulation of solid/liquid interfaces can help to shed light on the elementary reactions involved in the early stages of electrochemical nanoparticle growth and can provide a better understanding of experimental reaction parameters.